The goal was a Williamson Flying Club fly-out to Lake Placid for lunch with opportunity to enjoy fall color in the Adirondack Mountains as in years past. Most predictions indicated an early autumn, so September 23 was chosen in advance as the day to go. Fortunately, VFR conditions prevailed as the day developed (a similar trip was cancelled three weekends in a row last year), but with a twist for the end of September: Lake Placid was forecast to reach 80°F! Based on their airspeeds, aircraft launched from the Williamson Sodus Airport at staggered times throughout the morning to target an 11:30 am arrival at Lake Placid. Though it was active, several pilots in the group chose to fly through the Lowville MOA. 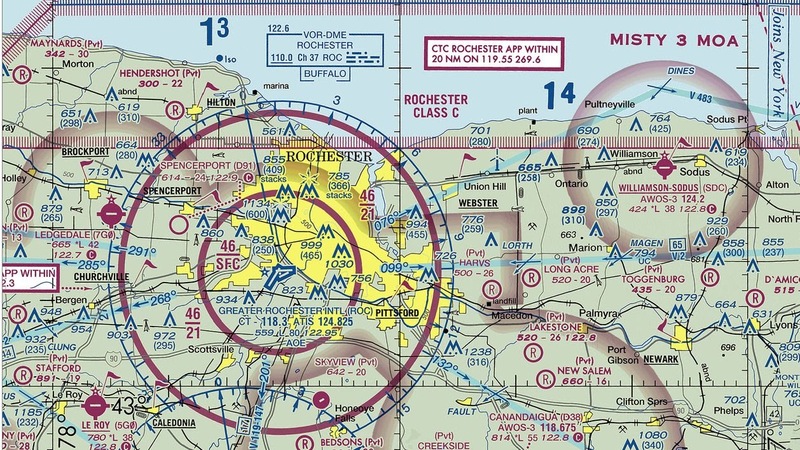 I chose to deviate around the area until Syracuse Approach notified me that the area had gone cold. At that point, I turned to a direct course for Lake Placid. My partial deviation around the MOA allowed Tom in Eight Five X-Ray and Mike in Six Echo Sierra to catch up to me. We flew the last half of the trip within a few miles of each other. Despite unquestionably VFR conditions, the mountains were cloaked in haze that dulled foliage color. It appeared that Williamson Flying Club pilots are good at flight planning. Four of us arrived more or less simultaneously at 11:30, including Mike in his Cessna 150 who left significantly earlier than the rest of us. The remaining aircraft landed within a few minutes of the first arrivals. Arrivals at Lake Placid should watch out for low-flying skiers! The Olympic ski jump towers are contained within the pattern for runway 32. As the other three WFC aircraft entered the pattern, we loitered 2,000 feet over the airport for spacing. Although there was some color to the terrain, it was not approaching the 85% of peak suggested by some sources on the morning of our departure. Most of the Williamson Flying Club ships parked in a line on the edge of a ramp ringed by the Adirondack Mountains. It is a foregone conclusion that the coolest airports have their own airport dog. Lake Placid does not have an airport dog, but that did not stop Lori and Denny from bringing their own. He quickly became the center of attention. Tom and Alicia arrived in Eight Five X-Ray. It was their second trip to Lake Placid with the group. Zach, a student pilot in the club, accompanied them to learn what $100 hamburger runs were all about. On board Warrior 481, I was joined by The Bear and my good friend Ed. Ed was the club's newest private pilot, having passed his check ride just the day before. This was cause for me to reflect: I was celebrating my fifteenth anniversary as a certificated private pilot. Lee and Rob arrived in Lee's Colt. 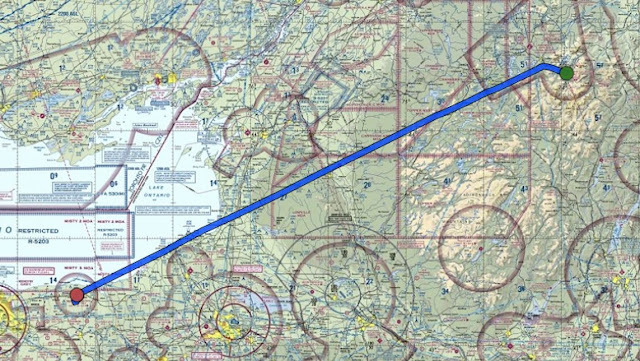 Lake Placid was the farthest straight line distance Lee had ever flown. Lori and Denny recently traded up to the Cherokee Six from their Archer II in part to facilitate travel with their "puppy". Candid shots are always way more fun than posed ones. Five Oscar Quebec: the flying dog limo. This is Mike and his Cessna 150. Until Ed passed his check ride, Mike was the club's newest private pilot, having passed his check ride in mid-July. Like Lee, the day's journey was also Mike's longest straight-line distance flown to date. But Lake Placid was a mere stepping stone to more serious adventure. Soon, Mike and the 150 will launch for Florida. In all, seven airplanes from the Williamson Flying Club carried seventeen people and one dog to Lake Placid that day. Lake Placid has a free bus service (the "Trolley") that runs on a loop around town. Though the airport is not formally on the circuit, Adirondack Flying Services will usually call it on the CB radio and it will divert through the airport parking lot. Unfortunately, Jason was the sole person working at the FBO that day and was dividing his time between line duties and flying sight seeing rides in the FBO's neon yellow Cessna. With no one available to call the Trolley, we decided to hoof it and eventually caught the Trolley along the way. Our destination was the Lake Placid Pub and Brewery. The Bear liked the three dimensional sign.This place was three stories of bustling activity and there was a wait for food, but it was all tasty. They stridently do not accept reservations, but true to their promise, they accommodated our group at a couple of different tables. Frequent readers of this blog will know without my saying what The Bear ordered for lunch. 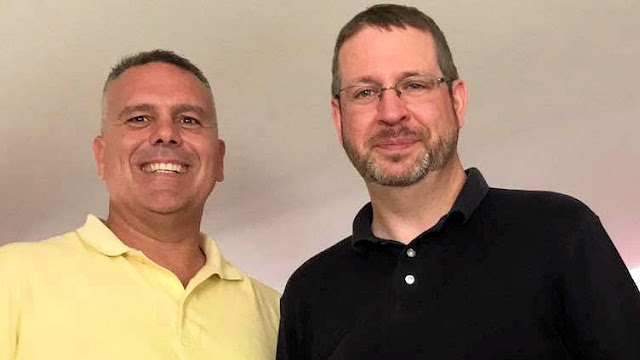 Proof that hangar flying does not require a hangar, Alicia and Tom regaled us with the tale of their recent cross country flight to Wiscasset, Maine. Ed talked about his check ride. Tom described his flight with Matt down the Hudson River Special Flight Rules Area. All good stuff. Lee just looked happy to be there and we were happy to have him. Zach seemed pleased to be along for the ride. Flying with Tom, he was in good hands. We were in agreement that the fries at Lake Placid Pub and Brewery are outstanding. Rob first flew with us on a run to Puddle Jumpers back before they closed. The last time I saw Rob, Elmira Tower was doing a fine job of getting him lost while taxiing at the airport. The missing taxiway signs did NOT help. These two guys epitomize the range of aircraft that arrived in Lake Placid that morning. Mike departed the Williamson Sodus airport well before us in his 90 knot Cessna 150 to arrive right on time at 11:30. Barry, on the right, probably left sometime well after us in his Piper Seneca. When not flying the Seneca, Barry often arrives at fly-ins with a beautiful Grumman Widgeon that becomes the center of attention even more quickly than Lori and Denny's dog! Lunch was outstanding (once it arrived). Two thumbs up. For obvious reasons, none of us sampled the beer. As we waited for the Trolley to take us back to the airport, The Bear found a tiny flower in the grass to photograph. It was the sort of thing that only she would have noticed. Hundreds of feet had probably already walked on or past it that day before a little girl with a sharp eye arrived with her camera and took notice. Back at the Lake Placid Airport, The Bear reunited with Lori and Denny's pup. The group dispersed pretty quickly after that and my attempt to corral everyone for a group photo fell apart quickly. Zach assisted Tom with preparations to commit aviation in Eight Five X-Ray. Tim and Mike found that Six Echo Sierra needed some oil and moved to rectify the situation. Tim proudly served as ballast for the flight to Lake Placid while Mike and Tony shared flying duties. Tony flew as Pilot in Command on the return trip and looked every bit the part doing it. A line was forming at the fuel pump. Mike was second, Lee third, and Warrior 481 fourth. A gorgeous polished metal vintage Cessna departed before the rest of the WFC. Probably a wise choice. Barry and two other pilots launched for home in the Seneca. I suspect they were back in the Rochester area before we finished paying for our fuel. I have scarcely seen the Lake Placid Airport ramp as busy as it was while Tom taxied Eight Five X-Ray for departure. While we were there, we met one other pilot out of the Rochester area and a former Williamson Flying Club member who learned to fly with the club in the 1980s. Lee refueled Seven Zero Zulu while we waited our turn. Waiting for departure, we took one last look at Whiteface through the hazy afternoon air. That same hot, hazy air would mean a sluggish climb out. We held short of the runway for a landing Cessna. Though Lake Placid has an elevation of only 1747 feet above sea level, at 80+°F we certainly felt the effects of higher than usual density altitude as we climbed out of the valley surrounding Lake Placid. 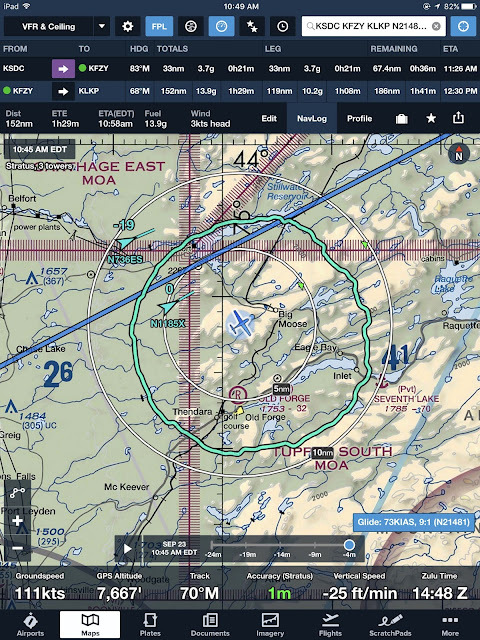 Normally, I climb right over the mountains on departure, but this time, I followed the low terrain toward Saranac Lake until we gained enough altitude to turn on course. We cruised hands-off much of the way home at 8,500 feet, putting us just above the haze layer with the late afternoon sun in our eyes. I realized that it had been a long day when I noticed the lengthening shadows cast by wind turbines south of Wheeler Sack Air Force Base. It was a terrific day to fly. Though I was disappointed by the lack of vibrant fall color, the mountains are always beautiful to visit, whether bedecked in reds and yellows, greens, or austere winter dress. What most stood out to me that day was the fellowship; flying to a beautiful destination with friends, seeing the experience through the eyes of a student pilot, and cheering on two low time private pilots who accomplished their longest flights to date in their own airplanes. I was glad to have played a role in making it all happen. All things considered, it was not a bad way to spend my fifteenth anniversary as a pilot. Close the flight plan by phone on arrival (I used to write "CFP" for "close flight plan" on the back of my hand to help me remember this). These actions would satisfy the requirements of being on a flight plan, squawking a discrete transponder code, and participating in two way communication with air traffic control for the border crossing. After a 2010 mishap with Flight Service resulting in our being reported overdue while still en route across Ontario, I followed the advice of a Flight Service briefer and regularly activated my VFR flight plans on the ground by phone. This was useful because in-air activation was often problematic as a result of RCO outages and/or poor audio quality. Depending on the situation, I receive clearance from Ground Control or Clearance Delivery (at towered airports), by phone prior to take-off, or in the air from the local radar facility (Approach or Center). The rest of it is automatic. There are no concerns about hearing "radar service terminated" along the way. That can and does happen while VFR. There are no concerns about remaining VFR should a cloud layer present itself en route. On landing, Tower closes the IFR flight plan automatically or, if landing at a non-towered airport, I cancel in the air when I can. On occasions when I fly an approach to a non-towered airport, I may still need to remember the phone call for cancellation. Exercising an instrument rating has definitely shifted my preference to using towered airports. Then, two weeks ago, my attitude indicator malfunctioned. Mom was out of the hospital and recuperating at home. With a pristine weather forecast and high pressure dominating the entire route of flight such that there was virtually no wind aloft, I decided to visit. The Bear had a cold and remained at home with Kristy. We always want clear heads in the airplane (in more ways than one). I have scheduled Warrior 481 to have her mechanical attitude gyro replaced with a Garmin G5 solid state electronic indicator. These are selling faster than Garmin can make them and they are currently back-ordered into October. In the meantime, the Warrior's vacuum pump was old enough that I had it replaced as a preventive measure. Without a reliable attitude indicator, however, I was not going to file IFR to Michigan. I read a self-contradictory weather forecast the morning of the flight. Though every terminal area forecast for every airport along the route indicated VFR conditions after 9:00 am, three separate IFR AIRMETs covered the entire route of flight until 11:00 am. I decided to launch anyway and resolved to use Flint as my alternate because it had a better forecast than the rest of the route, was outside of the AIRMET areas, and still reasonably close to Mom. After filing a VFR flight plan through ForeFlight for the first time, I was on the run-up pad for runway 28 at Sodus. It was 9:00 am with 10+ mile visibility and a clear sky. With run-up complete, I attempted to call Flight Service to activate the flight plan before take-off, but I could not get my phone to pair with the Zulu headset by Bluetooth. First world problems, true, but I did not want to waste time fiddling with it and I did not want to shut the engine down just for the sake of making a phone call. 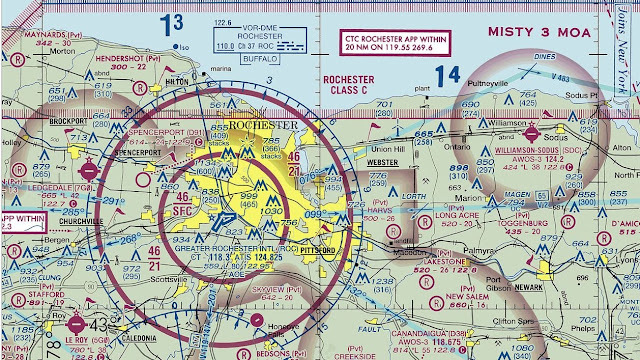 Instead, I consulted the sectional chart, identified the frequency for the Flight Service RCO co-located with the Rochester VOR (122.6), and decided to activate in the air. After making contact with Rochester for flight following, I requested to go off frequency to contact Flight Service. "Buffalo Radio, Warrior 21481 on 122.6," I broadcast. Then I waited. I broadcast again and waited. I swapped over to my #2 radio, which has a lower squelch setting than the #1 and repeated the call. Nope. I was reminded of numerous experiences in years past when I struggled to reach Flight Service while airborne. I double checked the frequency, verified adequate volume on the radio, ensured that I had the correct radio selected at the audio panel, and tried a fourth time. At first, there was nothing but a faint crackle. Then, I heard an elderly voice with just a hint of a waver that lacked the confident presence one usually hears on the aviation band. "Aircraft calling Buffalo Radio, say call sign again." The audio quality was abysmal, but understandable. Intellectually, I understood that I was not talking to someone in Buffalo. Flight Service Stations were privatized and consolidated into a small number of facilities years ago. I wondered if low demand had driven even further consolidation since the last time I called Flight Service. I envisioned a cartoonishly weather-beaten little shack in the middle of Nebraska to which all Flight Service RCOs fed. It was staffed by one little old man with a long white beard who listened to an ancient radio set through an ear trumpet, his face lit by the glow of vacuum tubes. In a corner, a rusty saucepan collected water leaking through the roof. Somewhere in the distance, a donkey brayed. I shook my head, reigning in my imagination, and responded. "Buffalo Radio, this is Warrior 21481." "Warrior two...one...four...eight...one," repeated the Flight Service Specialist haltingly, struggling with the readback. "Say request." I gave my spiel, requesting activation of my flight plan to Pontiac as of 1300Z. "Warrior 21481, VFR flight plan will be activated as of 1315Z...wait..." The radio fell silent. If he wanted to activate at the current time, I was fine with that. I was more concerned about how long I had been off-frequency from Rochester. He returned, amending the activation time to 9:00 am and warning me that I was departing from an area with an active IFR AIRMET. I already knew that, of course. The air was hazy, but I could already see Buffalo roughly 30 miles away. I acknowledged and flipped back to Rochester Approach. A new controller was working the position, but she seemed unperturbed by my absence. A few minutes later, she passed me to Buffalo. I was admiring Niagara Falls from just east of the international border when Buffalo called. "Warrior 481, radar service terminated." He paused just long enough for me to process a mental "dammit! ", then continued. "Keep the squawk. 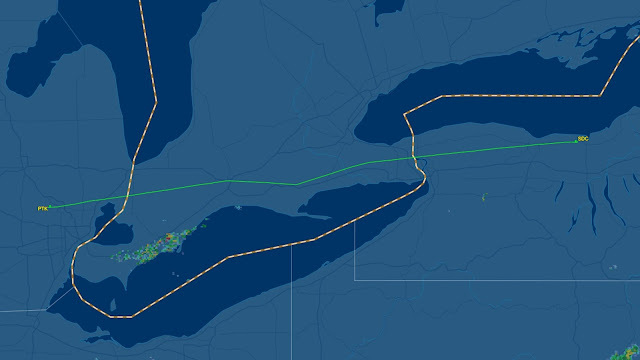 If you want further flight following, try contacting Toronto Center on 133.4." I did and Toronto was helpful as always. Everything worked out fine. I was on my way to visit Mom, substituting a 2.5 hour flight for a 6+ hour drive. However, I was annoyed by both the clunky radio interaction with Flight Service and about being dropped from flight following. This thought was quickly followed by the realization that I was spoiled after four years of seamless IFR travel across Canada. I enjoyed the sights of Ontario passing below, including localized low clouds around some wind turbines. It was not Fall yet, but the landscape was beginning to hint at Autumn's arrival. On a long final approach to runway 27L at Oakland County International, I spied the former Pontiac Silverdome in its death throes. The lower bowl seating was almost entirely demolished. At the airport, taxiway rework continued. This week's visit presented an entirely different array of closed taxiways to negotiate than two weeks prior. As I rolled out for landing, the controller pitched a roundabout taxi route to Michigan Aviation requiring three runway crossings before countermanding himself and offering a simplified route that involved back-taxiing on the main runway. As before, the wonderful people at Michigan Aviation offered me one of their crew cars for the day. When I expressed concern about tying it up for several hours, the lineman waved this off by saying, "That's what they're there for." Like last time, I topped off the tank before returning the car. Michigan Aviation has been our home at Oakland County International for many years now and they have always treated us very well. Jeff and me standing. Photo by Mom, sitting. Mom looked great, even though she was only a couple of weeks into recovery from her surgery. We talked for a while until Jeff, one of my closest friends from high school, arrived for lunch. I knew that I would be hungry when I arrived in Michigan, but Mom's feeding tube and limited mobility meant that I would not be going out to lunch with her. I worried a little bit about subjecting her to more visitors, but Jeff and I used to spend enough time at each other's houses that he has referred to her as "Mom" for years and the three of us had a good reunion. After lunch, I spent the rest of the afternoon with Mom. We went for a short, careful walk around the village and stopped by a luncheon at a neighbor's house. By 3:30, Mom needed rest and I needed to head back to the airport. It was a short visit, even though the logistics of flying back and forth made it a long day for me. Regardless, Mom appreciated having me there, which is what I set out to achieve in the first place. Learning from that morning's mistake, I called Flight Service on the phone from the airplane just before I was ready to crank the engine. In the old days, Flight Service would sometimes balk at a request to activate a flight plan a few minutes in the future. Not so today. "This is N21481 on the ground at Pontiac. Can you activate my flight plan to Sierra Delta Charlie ten minutes from now?" "I sure can!" came the enthusiastic response. I like enthusiasm, but this was a little bit over the top. The rest was easy and before long I was in the air squawking and talking with Detroit. At 7500 feet, I listened to some music and enjoyed the proto-Autumn landscape of Ontario rolling past in reverse order from that morning. I had the late afternoon sun at my back and a mild tailwind. Weren't there fields like this in an X-Files episode? Throughout the flight, I periodically uncovered the attitude indicator to check in on how it was doing, glutton for punishment that I am. It displayed a number of different attitudes, some surprisingly accurate, some wildly off-kilter. Aside from these spot checks, I left the instrument covered for the duration of the flight. Not quite halfway home, I caught myself yawning. I could feel fatigue gathering in my shoulders. I am not nearly so tired as I would have been driving the 13 hour round trip, I thought to myself as I flew over where the 402 out of Sarnia dead-ends into the 401 near London, Ontario. Coincidentally, this is usually the point on the return drive where traffic usually picks up and fatigue sets in. At one point, I encountered a large build up near Tillsonburg. It was the only one and I could see it from miles away. I had a brief moment of anxiety. Should I climb or descend? What lurked behind it? I went around. My deviation planning and return to course were a little crisper than they were during my VFR days. Flying IFR has certainly tightened my flying precision. Despite many crossings of the Welland Canal, this was the first time that I took a moment to study three of the eight locks that step ships down a total of 326 feet from Lake Erie to Lake Ontario. A downhill swath of the Niagara River foamed with rapids leading to the Whirlpool. I noticed a large, red-roofed resort set near the river gorge and wondered if it was the Great Wolf Lodge. It was. Score one for me. As someone who was devoutly VFR-only for many years, my sour reactions to flying this trip VFR surprised me. Opening the VFR flight plan through Flight Service on the outbound leg was an annoyance. Being dropped from VFR flight following and debating about whether to go above, below or around the cloud build-ups added a little bit of extra work and angst to the flight of a sort that I have not needed to worry about for a while. With respect to that angst, I realized that flying IFR has become a security blanket for me on the hop across Ontario. It brings a comforting level of certainty. I know that I will not be dropped from the system. I know that I will not become trapped above the clouds. While I am still learning and the IFR rating comes with some additional concerns that must be managed (e.g., go/no-go weather decisions, undesirable routing), I am evidently more comfortable in the system than I realized. However, the most important thing is that I was there in person to support Mom in her recovery, regardless of how I accomplished it.